How cute is that little guy in the sand? And his toes? Well, I accidentally stamped part of the sentiment over one of his toes, but he's still adorable. This is a new set from Lizzie Anne Designs called By The Sea. I love it! I just got the set Shore Thoughts, so I was thrilled to see that you can use these two sets together perfectly! I can't wait to play more! See the sand? I'm happy with how it turned out. I used my Copic Air Brush System! Oh, I LOVE that little air gun! I first masked my images with my Eclipse Masking tape (that stuff is THE best), then I air brushed E34 using the chisel end all over at different distances away from my paper. When it was nice and covered, I put in my E25 marker but with the brush tip at the end of the gun, then shot tiny little speckles all over. I pulled the tape, colored the images, then added some shadows with my YG91 marker. I'm totally saving up to get a compressor. 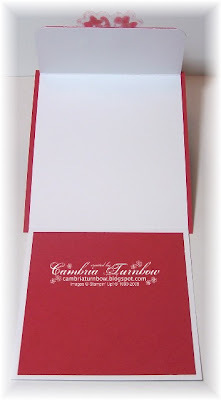 Paper: Shimmery White, Real Red, Baby Blue Medium & Nautical Blue Medium Prism, A Shore Thing-Cool Paper. Ink: Brilliance Graphite Black, Copics E00, E01, E34, E25 YG91, R24, R27, Y32, B21, B23. Other: LuminArte Yellow Rose & Persimmon with my Aquapainter (for the crab). 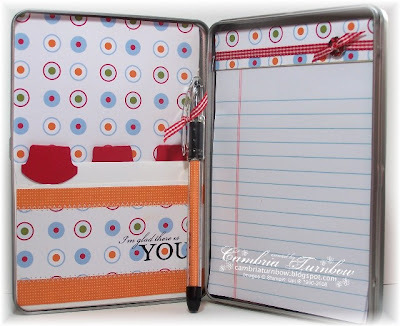 Dimensionals, Gingham Ribbon, Circle punch, Real Red Brads, Crafter's Tool Kit, Scor-Pal. I haven't decided what I'm going to stamp on the inside yet, but you can see there is plenty of room for writing, or even including a photo. 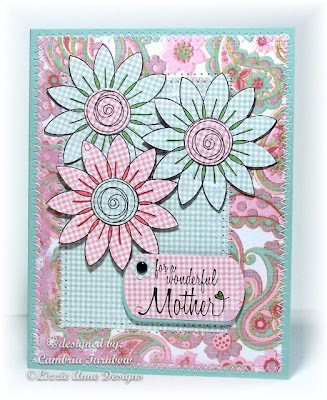 LOVE this style of card.... you are DA BOMB Rose Ann!! Stamps: Time Well Spent, Mixed Greetings. Paper: Shimmery White, Whisper White, Summer Picnic Designer Paper, Real Red. Ink: Brilliance Graphic Black, Wild Wasabi. Other: Copic Markers and Blender Pen, Crystal Effects, Basic Grey Magnetic Snaps, Corner Rounder Punch, Scor-Pal. Last chance to take advantage of the Free Wheelin' Promotion and the Extra Hostess Benefits Promo from Stampin'Up! is Wednesday, April 30th. Don't miss out on that free Jumbo Wheel!! Have a super week everyone! Thanks for stopping by! 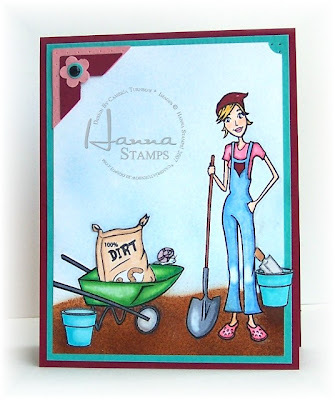 In The Garden.... one of the new sets being released this Friday at Hanna Stamps! Look at Hanna... she's cool in the garden too. Love her Crocks! 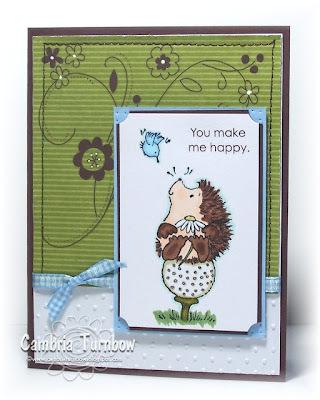 "Hey everyone, want to do a fun Challenge and have a chance to win a FREE Hanna Stamp Set? 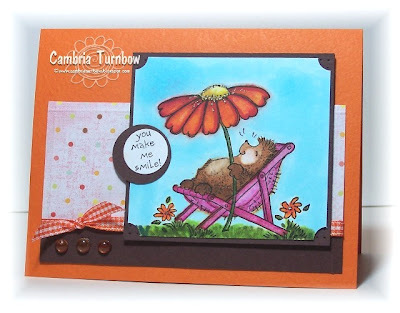 I challenged the Hanna Design Team to do a Color Challenge,they are going to make a card using Prism Paper, and one of the new stamps sets that will be released Thursday Evening. Evening May 1 st. during the release party. Party is 9pm EST." Hope you can come over and play with us.... maybe you'll win a free set!! Trust me, you'll love all the new releases. 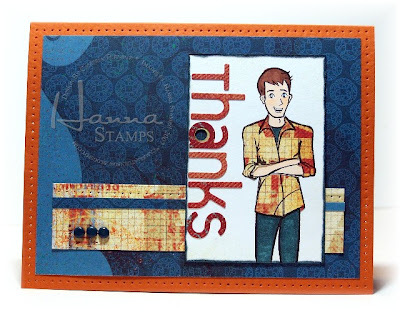 Go check out the cool stuff going on over in the Hanna Stamps Member Forum!! Paper: Crab Apple Light, Vibrant Teal, Rose Dark Prism, Neenah White. Other: Copic Air Brush, Air Can, Eclipse Masking Tape, Colorless Blending Copic and solution (the juice), Glossy Accents, Craft Knife, Photo Corner Punch, Three for You Punch, Vintage Brads, Crafter's Tool Kit, Scor-Pal. My photo is a bit washed out..... I need the sun to pop out over here on the OR coast. I'll try again later this afternoon. Thanks for stopping by! Hope you have a great day! The notebook cover is cool. I've wanted to make one ever since I saw one on my friend Cindy's blog. Then, I forgot that I wanted to make some, but when Leann came to Eugene a few weekends ago, she brought hers... of course it was AWESOME. It's held closed by those cool little magnets from Basic Grey. You can get complete instructions here on Cindy's blog. That girl is BRILLIANT! Thanks for sharing Cindy!! Paper: Pretty in Pink, Whisper White. Ink: Whisper White Craft, Brilliance Graphite Black, Color Box Pink Cat's Eye. Other: Paisley Ribbon (unknown), Basic Grey Magnets, Clear Button, 1 inch Circle Punch, Pink Gingham Ribbon, Janome Sew Mini, Scor-Pal, Note Pad. Hope you all had a great weekend. Thanks for stopping by!! One more masculine card for the Hanna Challenge in the member forums at SCS. My son needed to send some thank you cards out for birthday gifts and I think these will be perfect. The paper is from the Recess Collection Pack by Basic Grey. It comes with all the paper and two full sheets of letters and punch out shapes. I was saving it for some scrap pages, but who knows when I'll get to that, plus my oldest son is a little stinker when it comes to getting his photo taken. Besides, there is so much in the pack, I can make a few more cards and still have a ton for scrappin'. 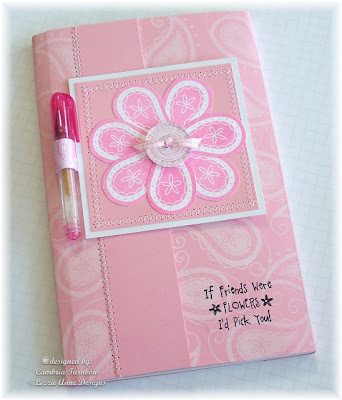 Love the page of sticky letters... I had no idea they were in there until I opened the pack. Very cool. 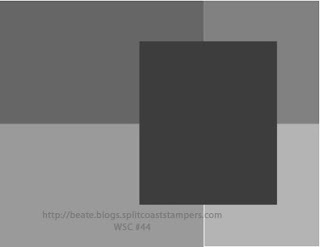 The layout is Beate's Weekend Sketch Challenge. His jeans are slightly faded with my Copic Colorless Blender with "the juice". I used the chisel end of the pen. Paper: Papaya Puree Dark Prism, Recess Collection by Basic Grey, Georgia Pacific White. Other: Crafter's Tool Kit, Earth Element Brads, Cropadile. TGIF! Wow, what a week. I didn't think another week could go by as fast, but DANG, it's Friday.... AGAIN! You know what that means... Beate's Weekend Sketch! Other: Round Scallop Punch (Marvy), White uniball Gel Pen, Striped Ribbon (Stampin'Up! ), Dimensionals, Sakura Glitter Pen, Coluzzle. Okay... so I told ya last week about the Hanna Design Team Challenges on Friday's too? Well, this week, the challenge was masculine. Once again, I combined these two challenges. Check out the challenge in the Hanna forums at SCS and come play along if you can. Put HSC14 in the keyword section when uploading your creation! Paper: Prism Sugar Cream, Recess Basic Grey Collection Pack, Neenah White. Other: Quickie Glue Pen, Earth Element Brads (SU! 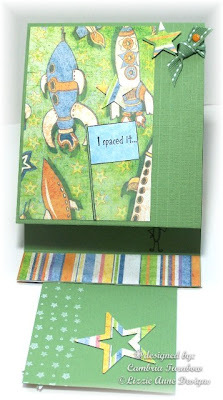 ), Crafter's Tool Kit, Ticket Corner Punch. I love that stamp.... my friend Val sent it to me (The YOU GO GIRL). I think any girl who takes on power tools definitely deserves a big YOU GO GIRL... with a snap! See her jeans? They look textured huh? Remember when I mentioned the "magic juice"? Well, it's not really magic, it's the blender refill and you can get it in big bottles. Oh, this stuff is cool... hence the reason we call it the magic juice. So, you do all your coloring and blending, then you can take almost anything and add a dab of "the juice" to it, then blot it directly on your image. For her jeans, I used a Jack in the Box Napkin (hey... it was on the table). Maryanne (my Copic idol) used a wash cloth, a lace doily... oh, and we even tried gauze! It's SO much fun!!! You can get all kinds of textures. I used the blender pen to wear out her knees. Remember, you keep adding or taking away color... saturate that paper baby! I love "the juice".... can't wait to play with it more. I can't wait to get MORE markers. So, when you get your Copics, make sure and add a bottle of the colorless blender solution.... don't ask for "the juice"... they may think you've been drinking it. LOL. Paper: Prism Blush Red Dark, Neenah White, Chatterbox (blue), Love,Elsie(Stripes). Other: Glossy Accents, Screw Brads, Slit Punch, Crafter's Tool Kit, Black Glaze Pen, "The Juice", Scor-Pal. I have another busy day tomorrow, but hopefully I can post again in the evening. If you've emailed me and I haven't responded yet, maybe email me again. (I'm sorry) I'm having trouble with my junk filter, and I'm also behind... I'm trying to catch up. If you leave a question in the comment section, I will do my best to get you an answer. Thanks everyone. Have a super week! My friend Bev sent me this image .. I was suppose to post it yesterday, I colored her when she arrived, then put her up until I could find some time to put her together, then I couldn't find where I put her! I found her today! So, I'm a late, but I made it... mission accomplished! Did I tell you that Verizon is finally in my area? Yah, I think I did. We switched and now I have a phone with a keyboard and I can text! I'm such a dork... so happy over the little things. I can almost keep up with my son... now he can't tease me about taking an hour to reply to him. I've been texting everyone I know that is "IN". It's so much fun! So, that is what my card says.... text me! I totally CASE'd the layout from my friend Lana... she always does awesome layouts with designer paper. This paper is from Daisy'Ds... it's the Maybe Baby 8x8 pad. LOVE it! 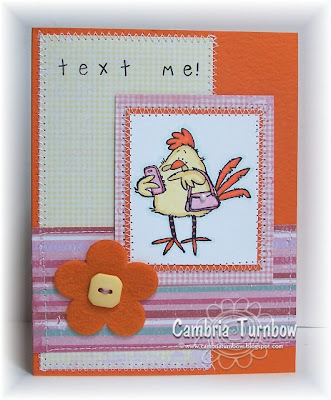 Stamps: Text chick? Not sure, but I think she is Penny Black. 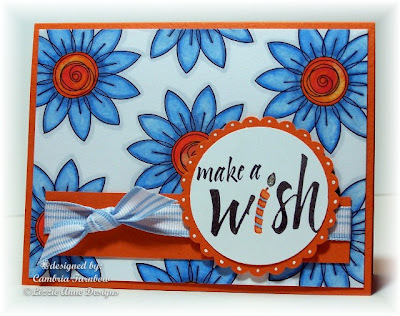 Paper: Prism Intense Orange, Whisper White, Maybe Baby 8x8 Daisy D's Pad. Other: Pretty Pearls (Ellen Hutson), Flower Fusion and Button (SU! ), Janome Mini, Snap Stamps, Scor-Pal. Thanks for stopping by everyone! Hope you had a great Monday! I don't know where my weekends go... I really need at least one more day in the weekend. What do you think? Yah, we could all use one more day huh? I tried to keep busy this weekend... which wasn't hard because I had a workshop on Saturday, then I worked on this most of Sunday (plus the laundry that piled up from last week). I was pouting because all my friends were down in CA for Stamp Mania. Well, not ALL my friends, but I swear most of them. I texted everyone I could think of so that they would all give each other hugs from me. I just switched to Verizon and I'm feeling pretty cool finally being "IN". I'm driving my BFF's crazy. Now I have a keyboard and I can ALMOST keep up with my 15 yr. old. Nothing like being able to text to make you feel cool. I've had these DVD tins forever. One of those things I ordered, then had to put aside because I've always got too much on my plate (don't we all?). I had a scare this week. Last month, on the VERY last day of the SAB recruit special, I had a customer call and tell me she decided to sign up. She had a knee surgery soon, but she thought she could still meet her minimums if we could squeeze in one workshop before her surgery. Remember? I was over helping her get ready and I stayed for her first workshop. Gail is a sweetheart... we hit it off immediately. She is new to SU!, but totally makes a super demonstrator. Her excitement is contagious and brings back memories for me as a new demo.... oh, how I remember the first time UPS rumbled up to my driveway with my first SU! box. She went in for her surgery and had a stroke. My friend Kathie, (who is Gail's long time friend) called me to tell me on Friday. It's the kind of news that just takes your breath away. The good news is that they expect her to have a full recovery! Of course at first I wanted to run right up to the hospital, but because I am a new friend of hers, I didn't want to intrude either... you know, you are not really sure what to do. Today, my friend Kathie (I love Kathie), called and told me that Gail would love company and that in the morning they are taking her to Eugene to a stroke recovery center. So, of course, I grabbed my dvd tin and got to work. This one was a little different than the other dvd tins I've done. Well, obviously because of the window, but it seemed a little fatter. I don't think it is though. I couldn't get the pen inside because the window takes up a bit of room on the inside. I know the inside looks a bit plain, but I really needed to get this to her before she left in the morning. The envelopes are our small ones... the note card envelopes. I tucked the flaps in then added tabs with the Round Tab punch. They are adhered at the bottom with my AWESOME Scor-Tape (LOVE THAT STUFF). So, you can pull them out a bit, yet they stay put at the bottom. I thought she could keep receipts or notes or business cards in there. I know it needs something up above but I ran out of time... maybe I'll ask for it back and add something later when she is home and settled. Gail was in good spirits as always... a ray of sunshine. I know she'll be back to doing everything she loves soon. If you'd like to send my new downline and pal a get well card, I KNOW she'd be beyond thrilled. Email me at cambriaturnbow@charter.net and I'll give you my address. I will hand deliver the cards when she gets home since I'm not sure how long she'll be in Eugene. Paper: Summer Picnic Designer Paper, Shimmery White, Pumpkin Pie. Other: Copic Markers, Copic Air Brush, DVD tin (with window), Clear Button, Tag Punch, 3/4 inch Circle Punch, Crystal Effects, Anchored Rub-Ons, Round Tab Punch, Note Card Whisper White Envelopes, Red Gingham Ribbon, Flower Slide, Chunky Glitter, RSVP Pen, Janome Sew Mini, Coluzzle, On Board Lots of Letters Chipboard. Hope you all had a great weekend. Thanks for stopping by! I'm combining two challenges today. I had a crazy week, and very little time to myself. 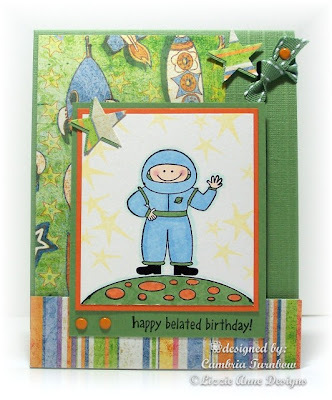 So, this is Beate's sketch AND, my challenge for the Hanna Stamps Card Challenge. Each week, the design team for Hanna takes turns posting a challenge over in the member forums on SCS. Can you guess what my challenge is? Well, pink, that's a given.. always. Go ahead, check out the challenge over in the forums and play along. 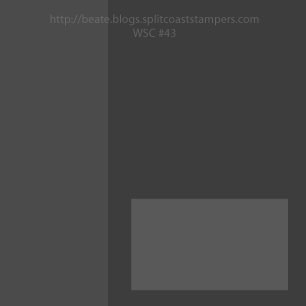 For Beate's sketch, you'll use WSC44 and for my Hanna Challenge, you'll use HSC13 in the keyword section when you upload. Of course you can always do both! Paper: Prism, Maybe Baby (Daisy D's), Whisper White, Basic Black. Other: Pure Color Pencils, Gamsol, Blending Stump, Crystal Effects, Flower Punch (Target), Round Tab Punch, Dimensionals, Black Glaze Pen,Crafter's Tool Kit, Janome Sew Mini, Scor-Pal. Okay.... I'm totally going to get to all the Copic questions, I promise.... and I will work on some photos too. Oh, and it is pronounced with a long O, not like cop ics.... but coooooo pics. You hear the O in the middle. Trust me.... I said it the other way too, but I think I finally got it (thanks Mounds). I'm going to get my coffee and then draw for a winner for the cOpic blog candy! See ya soon! Whooo Hoooo, Carrie, you are the winner of the Copics!! Hey Carrie.... email me your address and the Copics are on the way to your house!!! Wow, thanks everyone! Your comments were are all awesome and I LOVE the recipes!! Big thanks to Marianne from Copic Marker for being so generous! THANKS MARIANNE (my idol). First.... I have the sketch markers. That is what I prefer. The original Copics come with the chisel end (which I love, and used to color the sky in the previous post), it is angled and stiff, so you can color larger areas, but still use the tip if you need to get in a corner. The other end is a fine point end, similar to writing tip of the SU! markers but a tad bigger or maybe like you'd see in a regular "marker tip". These markers are more square in shape. The Sketch (My Fav) have the chisel end, then a brush end. LOVE the brush end. The ink "flows" out of these markers.... it's hard to explain, but more like a cross between an aquapainter and a marker. The tip end is very fine, so if you use a light touch, you can get into any tight area. These markers are oval shaped. The Ciao (pronounced Chow) have the same tips as the sketch. 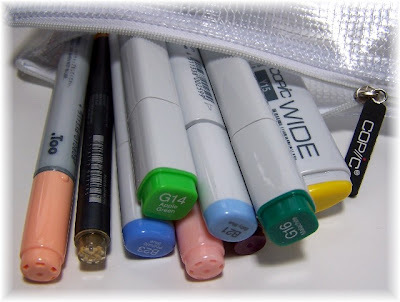 Marianne said they are perfect for people just starting out, or who want to "try" them, and that also many people buy them for their children because like I said, those tips , you do not have to be so gentle with... and remember too, that the tips are all replaceable.... all the Copics. The Ciao's are round, but smaller and not so fat. They have other tips to choose from too, but this is how the come. The only difference between the Ciao and the Sketch is that with the sketch you can use the airbrush system. At first, I totally thought I had the wrong markers and that I would have been fine with the Ciao, but THEN... omg, we got to play with the airbrush system... and OH DANG.... a whole nother post baby... and yes, I was gasping out loud again. Needless to say, I have the airbrush and a can of air, but I'm shopping for a small compressor. AMAZING. I'll save that for another day and try to stick to the questions you had. Next, you asked about the blending and if when you are using the lighter color it will harm the tip of the light color. NO WAY. OMG, Marianne was totally into torturing me, or maybe she enjoyed hearing me gasp. She grabbed a light YELLOW marker, then a dark color (can't remember what color because I went into shock, but let's say blue), then DREW ON THE YELLOW TIP with the blue. Then, colored on the paper and blended right from the tip of the YELLOW!!! YELLOW!!! Then, it just washed right out on the paper and was perfectly yellow again. I KNOW? Are you gasping? How many of you have stamped in your yo yo yellow pad with black? OR, have black tips on your markers from getting to close to the image? Yah, Cams was FREAKING OUT. So, then she showed us that you can do the same technique with shades of different markers direct from the marker, not just blending on the paper. When you are done, simply color out on your scratch paper until the color you added to the tip of your marker is gone. Do it, try it... you will be amazed. I want to tell you too, that a lot of the results you'll get will vary on the paper you are using. We were using Neenah White, and I've also heard that people get super results on the Georgia Pacific White. I have not tried coloring on my Whisper White yet. So, you need good paper... get it out and start experimenting. Find what works for you. If you are straight coloring, do not use watercoloring paper. It absorbs too much for the blending.... but not to say you can't watercoloring with these pens... more later on that. Okay... I seriously have a ton to catch up on today. Please feel free to continue to ask questions. I'm happy to help and after all, I'm CERTIFIED BABY! I have SO much to show you!! OMGosh how I LOVE these markers! You can also find out more at the Copic Website www.copicmarkers.com. Oh, the eSsentials pack at eP are the sketch. But you can order any style from them. Mounds is amazing... she knows all the numbers/colors. Her and Marianne were always throwing the letters/numbers out and I was like... DANG, stop talking in Copic Code. Someday, I will learn the Copic Code as well as Mounds. If you are a serious stamper, you want a lifetime coloring system where you can get artist quality results, I'd totally start with the sketch or the Original so that you have that option of the airbrush. Oh, and if you haven't already wondered, YES, the airbrush system is SO much more than just for coloring. I will try and get photos today of the four types and their tips. Thanks for stopping by everyone, and thanks for all the sweet comments. Fire away with questions, and don't forget to leave one comment in the Copic Candy Post for the drawing on Friday. Edited to say: See the photo of the blog candy? The greens are the original, the blue oval shape is the sketch, the round peachy colors with the holes in the caps, those are the Ciao. The holes in the caps are so that if your child swallows them, they will not choke... air can get through. See the big wide one? Betcha think you'd NEVER use that huh? Hmmmmm...... we'll see about that. SNORT. Oh... the pressure! YOU GUYS! You are all so sweet. I'm totally going to share what I learned, but remember I'm still playing with these and trying to apply what I've learned. I've been using them SO wrong. Well, not wrong, but totally NOT to their potential. First jaw dropping moment for me was when Marianne took a marker and literally smashed it on the paper. I gasped... out loud. I've been treating them SO gently like the tips were delicate or fragile. 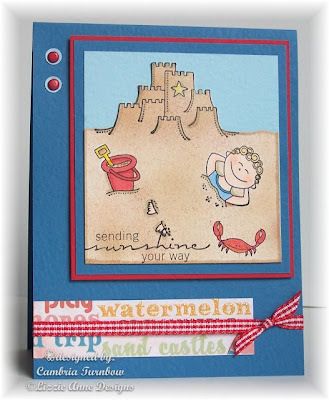 My Stampin'Up! markers are so frayed and I've always been gentle with them.... it's a bit disappointing, because I love SU! So, I invested in a small handful of these markers. I've been oh so careful with them, and then Marianne grabs one and says, "look what you can do"...... she was showing us a technique, but all I could do was gasp about her pounding on the end of that marker. Like seriously, my stomach was upset. She made me "smoosh" one before she would certify me.... it was REALLY hard to do. LOL. I'm practicing my smooshing Marianne! (I know that will make her proud... and I want to make her proud). So, first tid bit, don't be afraid to push and smoosh. The tips are QUALITY and will not fray. But, do not pull out the brush side to refill your markers... do the other side. Only pull out the brush tip when you are replacing them....which you do NOT have to do often... even if you smoosh. Second thing... I was not saturating enough. Start with your light color and go one or two colors up (they are numbered), then you blend the two together with the lighter color. So, do your light, then your darker shades, then go back and blend with your light. You can blend and blend and blend. You keep saturating until they blend. You want to turn your card stock over and see it all bled through to the back... if you don't see that, you are not blending enough. See this image? I totally colored on it ALL DAY. I had polka dots on the flower... I started with it all pink... I kept changing my mind and adding and blending. THERE IS NO PILING.... after ALL DAY of adding colors and blending. Picking up my jaw again. Next jaw dropping thing for me. The blender pens. 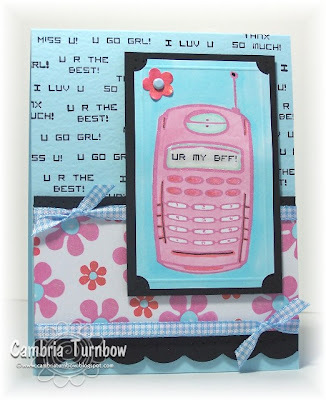 TOTALLY opposite of what we do with Stampin'Up! blender pens. Instead of blending, you are taking the color away... or more like pushing it. If you make a mistake and go outside the lines..... use the other end... I think it was called the chisel end (you can use either, but I like the chisel end for this) and "push" it back in. Let it dry and keep doing that process until the ink is pushed back into the line! How cool is that? *Close my mouth... jaw is hanging open again. That blender pen refill... or "The Magic Juice" as Mounds, Leann and I call it, is amazing. YOU NEED IT. Buy it by the gallon.... kidding... I don't think they sell it by the gallon. Maybe I should check? We learned SO many cool things with it. But, for now, I'm going to let this information soak in... get it? Soak in..... SNORT. Seriously... get out your markers, start with the light color, add your shades and blend again with the light. If that is darker than you want, get out your blender pen and take some color out. For those of you that don't have any Copics (I'm really sorry... I wish I could give you all some).... I highly recommend getting them in groups of shades just a few numbers apart. I started with the eP eSsentials because the shades are very close to the Stampin'Up In Colors, but I've found that I reach for them a lot and will continue to build on those colors. I've since added a few pink shades (go figure) and some blue. Needless to say, I've placed another order and I am counting down the days until they arrive. Okay.... I'm going to continue sharing everyday some tips and bits I've learned, otherwise, this post could be pages long. For those of you who are debating about these markers... they are a lifetime investment. If you are going to use markers, they will totally pay off and be HALF of what you will spend on others in the long run. Hey... I'm not working for Copic, but I swear I would if they'd stock me up with markers baby. I need a bumper sticker.... "will work for Copics", or "Where is Marianne?". I could totally be her stalker. Paper: Intense Orange Prism, Neenah White, Chocolate Chip, Imaginisce, A Shore Thing. Other: Round Punches 3/4 inch + 1 inch, Ticket Corner Punch, Spica Glitter Pen, Dimensionals, Gingham Ribbon, Robin's Nest Island Blossom Dew Drops, Scor-pal. Copics anyone???? Look what Marianne at Copic Markers gave me to share! I'm Baaaaaack! Oh baby..... I cannot even tell you how much fun I had with Marianne. I had to keep reminding myself to close my mouth. AMAZING. I would have paid SO much more for that class. I am going to be a Marianne groupie. If you are anywhere near Medford, OR this coming Friday (April 18th), you are CRAZY if you don't sign up and get Copic Certified. This class and Copic markers WILL BLOW YOUR MIND. I was gasping out loud. GASPING! I love Marianne and Copic Markers!!!! I had SO much fun!! I can't wait to share with you all the cool things these markers can do! As soon as I arrived, I received three hugs from Marianne.... so thanks girls!! Marianne did indeed give me your hugs!! I got to meet stampers that are in some of my stamp groups... it was SO fun to put names to faces. I wish we could have hung out longer! Everyone was as excited as me.... so can you imagine? We all wanted to just bottle up Marianne and take her home (her AND her Copics). If you leave a comment (I love easy recipes *wink*) , I'll have random.org choose a winner on Friday! Candy includes 1 Copic Wide Y15 (yellow), 2 Copics G14, G16 (Apple Green & Malachite), 2 Copic Sketch B21 & B23 (Baby Blue & Phthalo), 2 Copic Ciao E93 & E95 (Tea Rose & Flesh Pink), 1 Twinkling Like Stars Spica Glitter Pen and 1 Wine Copic Multiliner all in the little Copic Bag to go! I have SO much to catch up on today, but hopefully this evening I can put together some of the images I colored this weekend. See ya soon... thanks for stopping by! Hi Everyone! Whoo Hoo for Friday! I'm on my way to my Copic Certification Class with Mounds and Leann... plus I'm meeting some of my downline and some online friends to boot. Oh yah, excited baby! HUGE smile on my face! I learned how to do the scheduled posts, so if you see this.... it worked! 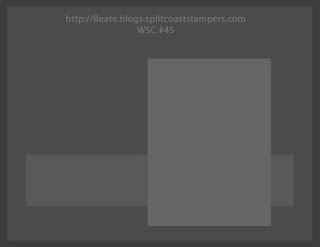 Time for Beate's Weekend Sketch challenge #43!! Yep, still thinking about my Mom... tomorrow is her birthday. LOVE YA MOM!! I used my Stampendous Doo Dad Alpha. HA... it's not really called that, but I love all the doodads you get with each letter, so that's what I call it. I only have the M for Mom, so I grabbed some flowers. Those cool little pearls are from Ellen Hutson's store. LOVE them.... you get all different sizes in each package. I'm stickin' em on everything. Paper is from my Daisy D's Maybe Baby pad. Cardstock is from Prism, called Island Mist. Okay here's the sketch ... hope you can play this weekend!! Have a great weekend everyone! I'm going to color until my fingers cramp! Thanks for stopping by!!! Love this little space dude.... love her as a dudette too! PERFECT for this paper from Basic Grey. This was a fun card. I used the Wasabi cardstock from the Holiday Glitz promo and used these cool magnets to hold it closed.... my kids just think it's THE coolest. 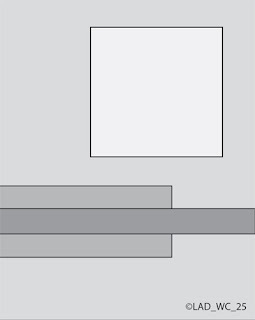 The main front folds down, then the back portion up. The inside says, " I Spaced it".... SO perfect for me. LOL. Open one more time and you see the alien, with the sentiment, "You're a Star". All included in this set from Lizzie Anne Designs. Okay... I'm going to add the recipe later, I'm on a mad dash to get going to Eugene. Still need to load the car! Thanks for stopping by... see you soon. My friend Bev leaves me THE best phone messages. The whole family loves to listen to them... and they are long too.. like we are talking. She makes my days with her messages. Now, If I'd remember to have my cell with me, I'd actually get to talk to her more. It drives my husband crazy... "why do you even have a cell.. you never answer it!". It's usually buried in my purse or in the car... I'm going to be better about that. So... had to send Bev a card and let her know how much I love her and how much she makes my days. She likes pink almost as much as me, so of course I had to send her a pink phone. 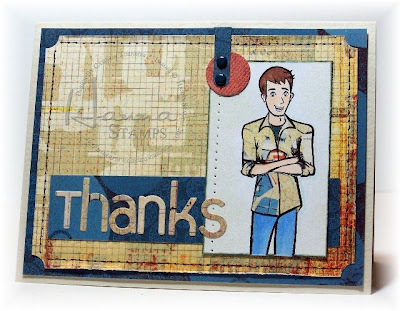 I made the background by sticking all the sentiments to one block and stamping over and over. I also used Crystal Effects on the screen to make it look real. I wish you could see the shimmer. I used my long lost Brilliance Pearl Orchid ink, and the Brilliance Rocket Red Gold, that I got when I was in WI. LOVE those inks... they are so pretty and shimmery. The embossing around the image is done with my Scor-Pal. Paper: Baby Blue Medium (Prism), Whisper White, Basic Black. Other: Three for You Flower Punch, Dimensionals, Ticket Corner Punch, Crystal Effects, Corner Rounder Punch, Soft Subtle Brad, Black Glaze pen, Blue Gingham Ribbon, Scor-pal. 1) You have to pick 5 blogs that you consider deserve this award for their creativity, design, interesting material, and also contributes to the blogging community, no matter what language. 2) Each award has to have the name of the author and also a link to his or her blog to be visited by everyone. Click on her name above to visit her blog. 3)Each award winner has to show the award that she has been given, by the one aforementioned. 4) Award-winner and the one who has given the prize have to show the link of “Arte y Pico” blog, so everyone will know the origin of this award. And... I got one more. Lucky me! This one is from my friend Juli Smith from StampinJewels. Here are the rules:In order to display this 'You Make My Day Award' proudly on your blog you must re-present it to 10 people whose blogs bring you happiness and inspiration and make you feel happy about blog land. Let them know through email or by posting a comment on their blog so they can pass it on. Beware, you may get the award several times yourself, and if you do, consider yourself really, really loved. I can't wait to stamp with the girls!! Whooo Hooooo (it slipped out). Oh, the card.. sorry. This is one I'll send Mom while I'm gone. OMGosh... I totally forgot that I bought this daisyd's cardstock stack months ago. I found it in my pile and was thrilled all over again. 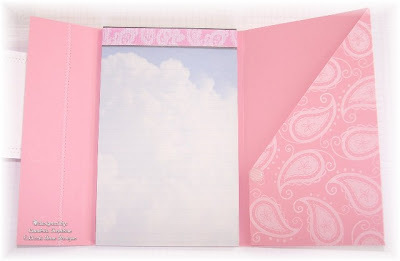 It's filled with all kinds of double sided patterns... and they all have a splash of pink! I can't believe I forgot about it. That is bad. I want to say that I have too much paper, but that sounds even worse.... can ya ever really have TOO much? The stamps are from Lizzie Anne Designs. Love their Simply Singles stamps. I knew I had to have the Mother sentiment as soon as I spied it. And... how easy would it be to just ink up the for a wonderful part, then add friend, husband, etc? The flower is also a single called Sunflower. Perfect for paper piecing or coloring. LAD is coming out with new sets soon.... I got a sneak peek, and oh dang, I NEED them all. Just wait till you see!! Paper: Prism Island Mist Light, daisyd's Maybe Baby 8x8 Pad. Ink: Brilliance Graphite Black, Copics YG63, R22. Other: Dimensionals, Pop-Up Glue Dots, Key Tag Punch, Tiny Flower Punch (Target), Vintage Brads, Crafter's Tool Kit, 3/4 inch Circle Punch (center of the flowers), Janome Sew Mini, Scor-Pal. I had too much coffee yesterday. My desk is a disaster! I did get a couple cards made though, and I have to say, I really like them!! 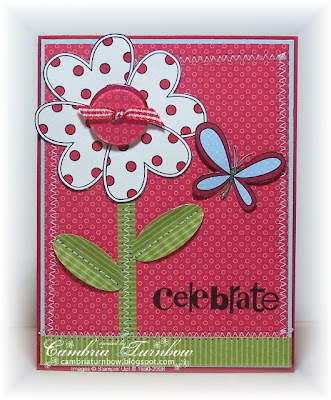 I love the heart from the Just Celebrate set in the Occasions Mini. 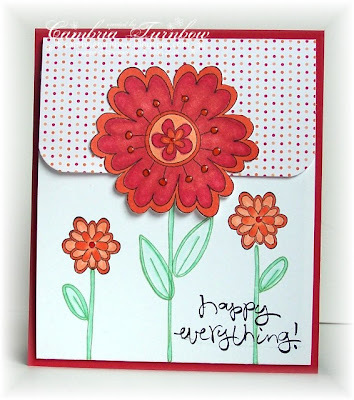 As I stamped a few out to color, I thought, why not try a flower? I tried to stamp a flower directly on cardstock with my stamp-a-ma-jig, but couldn't get them to fit right, so I cut out four and made a flower! I had some Summer Picnic paper scraps on my desk and the green worked perfect for the stem and grass. The leaves are made with the Small Oval Punch, then folded in half, then ran though my crimper. That was not my idea.... I copied that from a swap card by the brilliant Pam Findlay. I was having withdrawals from my little Janome Sew Mini, so I got it out and sewed. I feel SO much better now. I had to make another one. I had more scrap paper. And more hearts. You can never have too many hearts. I used my 1 inch circle punch to cut out some scrap paper and used crystal effects to stick it to my clear buttons for the center of the flowers. The butterfly is from the same stamp set. I stamped it directly on some scrap paper, then colored with my Copic Markers. I cut it out and put half a dimensional under the two top wings and glued down the main body. 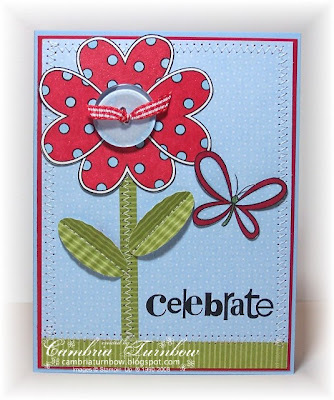 Finally, I added the Celebrate portion from one of the stamps in the set Phrases for a Friend set... also in the Occasions Mini. Love how these turned out... I'm going to make some more. The hearts are easy to cut out and color. Coffee is good indeed. Stamps: Just Celebrate, Phrases for a Friend. Paper: Real Red, Shimmery White, Bashful Blue, Summer Picnic Designer Paper. Other: Clear Buttons, 1 inch Circle Punch, Small Oval Punch, Crimper, Dimensionals, Gingham Ribbon, Crystal Effects, Stampin'Write Markers, Copic Markers, Scor-Pal, Janome Sew Mini. I love this image. Is it Penny Black? My friend Mounds (of Joy) sent it to me and I couldn't wait to color it! Yes... Penny Black, you can see them here. Oh my ... I want some! Look at the hedgie in the boot! I'm so excited! Joy and Leann are coming to Eugene to take the Copic Certification Class with me!! I get to hang with them ALL WEEKEND!!! Oh, the things we get to color! And I'm telling yah, Leann can COLOR! Remember when I was in Portland? She was magical with Sharon's Copics. It's not too late to join us getting all certifiable with Copics!! Paper: Summer Picnic Designer Paper, Whisper White, Bashful Blue, Chocolate Chip. Other: Dimensionals, Swiss Dots Embossing Folder, Cuttlebug, Gingham Ribbon (SU), Rub-Ons (SU), Uni-ball White Gel Pen, Crafter's Tool Kit, Ticket Punch (SU), Janome Sew Mini, Scor-Pal. Hope you all had a great weekend! Thanks for stopping by!